Experience an ancient Chinese water town plus the highlights of downtown Shanghai on this private door-to-door tour that’s tailor-made for first-time visitors. 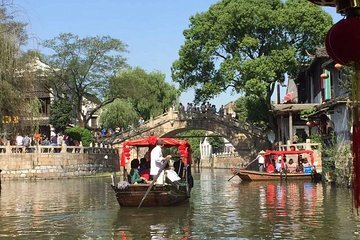 Traveling with your private guide, spend the morning exploring the peaceful lanes and tranquil canals of Fengjing Ancient Town, complete with a boat ride. After an authentic Chinese lunch, discover Shanghai signature sites including Yuyuan Garden, the Bund, and the Shanghai Tower Observation Deck: Upgrade to include dinner.